Our 100% Hand-Loaded 7mm 140 Nosler AccuBond rounds are loaded with extremely tight tolerances, producing highly accurate, consistent and reliable performance with each and every shot! We feel our proprietary load formulas and loading process create the finest round of ammunition available on the commercial market today. If you don’t load your own ammunition- let us do it for you! 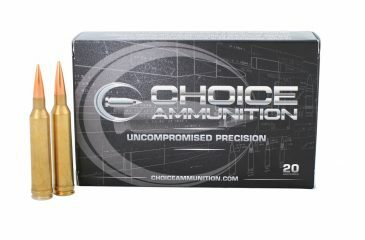 Choice Ammunition has taken our 100% hand-loading techniques and produce an extremely accurate, highly dependable round for the 7mm Remington Magnum in this load. Our loading tolerances are only matched by passionate hand-loaders in their own loading rooms. 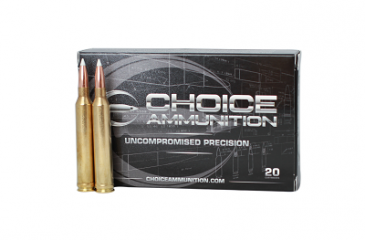 Consistent seating depths, powder charges and proprietary formulas of Choice Ammunition, make this 160 Grain Barnes TSX round the best you can buy on the commercial market today. 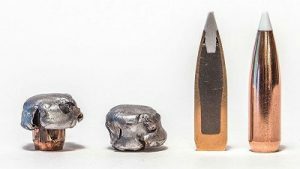 Since its introduction in 2003, Barnes’ TSX Bullet has earned a reputation as “the perfect hunting bullet.” This lead-free, 100% copper-constructed bullet provides extreme penetration every time. 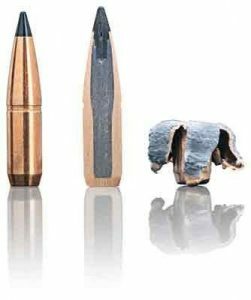 Typically, this premium hunting bullet retains 100% of its original weight even after smashing through dense tissue and heavy bone. The Triple – Shock bullet design incorporates a series of precisely positioned rings cut into the bullet’s body. These grooves relieve firing pressure, allowing the TSX to be safely loaded to higher velocities while reducing copper fouling. The bonus is that this is one of the most accurate hunting bullets you can buy. 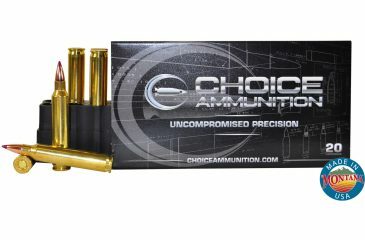 Choice Ammunition has taken our 100% hand-loading techniques and produce an extremely accurate, highly dependable round for the 7mm in this load. Our loading tolerances are only matched by passionate hand-loaders in their own loading rooms. Consistent seating depths, powder charges and proprietary formulas of Choice Ammunition, make this 139 grain Hornady SST round the best you can buy on the commercial market today. 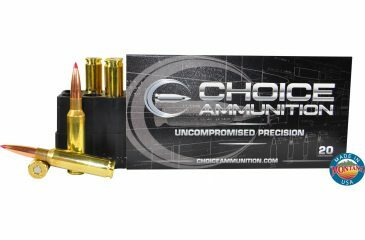 Choice Ammunition has taken our 100% hand-loading techniques and produce an extremely accurate, highly dependable round for the 7mm Remington Magnum in this load. Our loading tolerances are only matched by passionate hand-loaders in their own loading rooms. 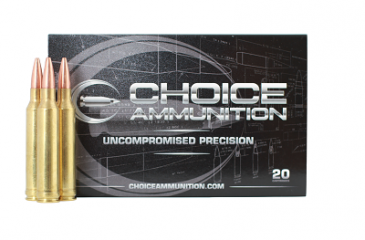 Consistent seating depths, powder charges and proprietary formulas of Choice Ammunition, make this 150 grain Scirocco round the best you can buy on the commercial market today. Our 100% Hand-Loaded 7mm 160 Nosler AccuBond rounds are loaded with extremely tight tolerances, producing highly accurate, consistent and reliable performance with each and every shot! We feel our proprietary load formulas and loading process create the finest round of ammunition available on the commercial market today. If you don’t load your own ammunition- let us do it for you! 7mm Remington Magnum 140 Grain Nosler AccuBond~ The 7mm Remington Magnum rifle cartridge was introduced as a commercially available round in 1962, along with the new Remington Model 700 bolt-action rifle. On its introduction, the 7mm Remington Magnum substantially usurped the market share held by the .264 Winchester Magnum, which went into sharp decline in popularity and sales after 1962. It is a member of the belted magnum family that is directly derived from the venerable .375 H&H Magnum. The original purpose of the belted magnum concept taken from the .300 H&H Magnum was to provide precise headspace control, since the sloping shoulders, while easing cartridge extraction, were unsuitable for this purpose. Improved cartridge extraction reliability is desirable while hunting dangerous game, which would be of concern when needing a fast follow up shot. The 7mm Remington Magnum is based on the commercial Winchester .264 Winchester Magnum, .338 Winchester Magnum, and .458 Winchester Magnum, which were based on the same belted .300 H&H Magnum and .375 H&H Magnum cases, trimmed to nearly the same length as the .270 Weatherby Magnum. 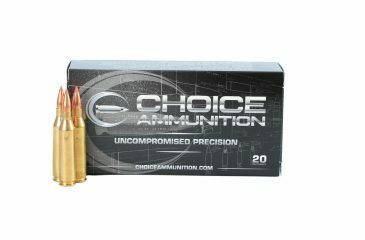 Choice Ammunition has taken our 100% hand-loading techniques and produce an extremely accurate, highly dependable round for the 7mm Remington Mag in this load. Our loading tolerances are only matched by passionate hand-loaders in their own loading rooms. Consistent seating depths, powder charges and proprietary formulas of Choice Ammunition, make this 162 grain Hornady ELD-X round the best you can buy on the commercial market today. 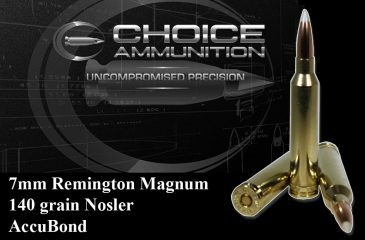 Choice Ammunition has taken our 100% hand-loading techniques and produce an extremely accurate, highly dependable round for the 7mm Remington Magnum in this load. Our loading tolerances are only matched by passionate hand-loaders in their own loading rooms. Consistent seating depths, powder charges and proprietary formulas of Choice Ammunition, make this 168 Berger VLD-Hunting round the best you can buy on the commercial market today.